Projectile points (used on spears or atlatl darts) are known from earlier prehistory, dating to the Middle Paleolithic. 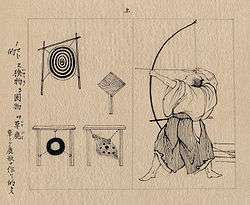 Bows eventually replaced spear-throwers as the predominant means for launching sharp projectiles on all continents except Australia. The bow seems to have been invented near the transition from the Upper Paleolithic to the Mesolithic, roughly 10,000 years ago. Spears or darts are much older; it has been suggested that some early points from Africa might have been arrowheads and that use of bows and arrows may date back as far as 71,000 years before present. In the Levant, artifacts which may be arrow-shaft straighteners are known from the Natufian culture, (ca. 12,800-10,300 BP) onwards. The Khiamian and PPN A shouldered Khiam-points may well be arrowheads. Bows and arrows have been present in Egyptian culture since its predynastic origins. The "Nine Bows" symbolize the various peoples that had been ruled over by the pharaoh since Egypt was united. 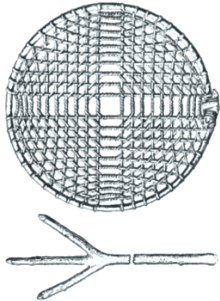 The hoop was often netted, like this. Archery seems to have arrived in the Americas via Alaska, as early as 6000 BCE, with the Arctic small tool tradition, about 2,500 BCE, spreading south into the temperate zones as early as 2,000 BCE, and was widely known among the indigenous peoples of North America from about 500 CE. An archery game was widely practiced among the societies of the Southern US which involved shooting at a hoop rolled with a forked stick. Points were scored based on how the arrow landed. The competition was popularly related to notions of fertility. After the introduction of horses to the Americas, tribesmen of the Great Plains became extremely adept at archery on horseback. The oldest Neolithic bow known from Europe was found in anaerobic layers dating between 7,400-7,200 BP, the earliest layer of settlement at the lake settlement at La Draga, Banyoles, Girona, Spain. The intact specimen is short at 1.08m, has a D-shaped cross-section, and is made of yew wood. European Neolithic fortifications, arrow-heads, injuries, and representations indicate that, in Neolithic and Early Bronze Age Europe, archery was a major form of interpersonal violence. Stone wrist-guards, interpreted as display versions of bracers, form a defining part of the Beaker culture and arrowheads are also commonly found in Beaker graves. 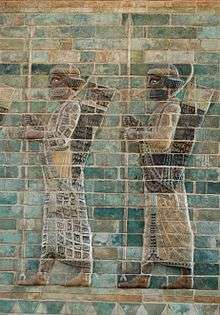 Archers with recurve bows and short spears, detail from the archers' frieze in Darius' palace in Susa. Siliceous glazed bricks, c. 510 BC. Ancient civilizations, notably the Persians, Parthians, Indians, Koreans, Chinese, and Japanese fielded large numbers of archers in their armies. Arrows were destructive against massed formations, and the use of archers often proved decisive. The Sanskrit term for archery, dhanurveda, came to refer to martial arts in general. Mounted archers were used as the main military force for many of the equestrian nomads, including the Cimmerians and the Mongols. The ancient Egyptian people took to archery as early as 5,000 years ago. Archery was widespread by the time of the earliest pharaohs and was practiced both for hunting and use in warfare. Legendary figures from the tombs of Thebes are depicted giving "lessons in archery". Some Egyptian deities are also connected to archery. "Arab Archery" is a translation of an Oriental manuscript dated approximately 1500AD. It describes the practices and techniques of archery among the Arabs of that time. An online copy of the text is available. Another treatise on Arab archery by Ibn Qayyim Al-Jawziyya, Muḥammad ibn Abī Bakr (1292AD-1350AD) comes from the 14th century. Further information on Medieval Arab archery can be found in a recent article by John Jandora. During the invasion of India, Alexander the Great personally took command of the shield-bearing guards, foot-companions, archers, Agrianians and horse-javelin-men and led them against the Kamboja clans—the Aspasios of Kunar valleys, the Guraeans of the Guraeus (Panjkora) valley, and the Assakenois of the Swat and Buner valleys. Detailed accounts of training methodologies in early India concern archery, considered to be an essential martial skill in early India. Legendary figures like Drona, are depicted as masters in the art of archery. Arjuna, Eklavya, Karna, Rama, Lakshmana, Bharata and Shatrughna the great warrior are also associated with archery. Skilled archers were prized in Europe throughout the Middle Ages. The Assize of Arms of 1252 tells us that yeomen were required by law, in an early version of a militia, to practice archery and maintain their skills. We are told that 6,000 English archers launched 42,000 arrows per minute at the Battle of Crecy in 1346. The Battle of Agincourt in 1415 is notable for Henry V's introduction of the English longbow into military lore. Henry VIII was so concerned about the state of his archers that he enjoined tennis and other frivolous pursuits in his Unlawful Games Act 1541. Archery was also an important skill for the Vikings, both in hunting and battle (cf. Viking Age arms and armour). The advent of firearms eventually rendered bows obsolete in warfare. Despite the high social status, ongoing utility, and widespread pleasure of archery, almost every culture that gained access to even early firearms used them widely, to the relative neglect of archery. Although early firearms were inferior in rate-of-fire (a Tudor English author expects eight shots from the English longbow in the time needed for a "ready shooter" to give five from the musket), and were very susceptible to wet weather, they had a longer effective range (up to 200 yards for the longbow, up to 600 yards for the musket), greater penetration, and were tactically superior in the common situation of soldiers shooting at each other from behind obstructions. They also penetrated steel armour without any need to develop special musculature. Armies equipped with guns could thus provide superior firepower, and highly trained archers became obsolete on the battlefield. The Battle of Cerignola in 1503 was largely won by Spain through the use of matchlock firearms, marking the first time a major battle was won through the use of firearms. In Ireland, Geoffrey Keating (c. 1569 - c. 1644) mentions archery as having been practiced "down to a recent period within our own memory" The last regular unit armed with bows was the Archers’ Company of the Honourable Artillery Company, ironically a part of the oldest regular unit in England to be armed with gunpowder weapons. The last recorded use of bows in battle in Britain seems to have been a skirmish at Bridgnorth; in October 1642, during the English Civil War, an impromptu militia, armed with bows, was effective against un-armoured musketmen. (A more recent use of archery in war was in 1940, on the retreat to Dunkirk, when Jack Churchill, who had brought his bows on active service, "was delighted to see his arrow strike the centre German in the left of the chest and penetrate his body"). ↑ Backwell, Lucinda; d'Errico, Francesco; Wadley, Lyn (2008). "Middle Stone Age bone tools from the Howiesons Poort layers, Sibudu Cave, South Africa". Journal of Archaeological Science. 35 (6): 1566–1580. doi:10.1016/j.jas.2007.11.006. "Explicit tests for distinctions between thrown spears and projected arrows have not yet been conducted, and many of the segments could have been employed equally successfully as insets for spears or arrows (Lombard & Pargeter 2008)." Lombard, Marlize; Phillipson, Laurel (2010). "Indications of bow and stone-tipped arrow use 64 000 years ago in KwaZulu-Natal, South Africa". Antiquity. 84: 635–648. doi:10.1017/s0003598x00100134. ↑ Blitz, John. "Adoption of the Bow in Prehistoric North America. North American Archaeologist, vol 9 no 2, 1988" (PDF). ↑ Needham (1986), Volume 5, Part 6, 124–128. ↑ "A trilobate arrowhead can be defined as an arrowhead that has three wings or blades that are usually placed at equal angles (i.e. c. 120°) around the imaginary longitudinal axis extending from the centre of the socket or tang. Since this type of arrowhead is rare in southeastern Arabia, we must investigate its origin and the reasons behind its presence at ed-Dur." Delrue, Parsival (2007). "Trilobate Arrowheads at Ed-Dur (U.A.E, Emirate of Umm Al-Qaiwain)".". Arabian Archaeology and Epigraphy. 18 (2): 239–250. doi:10.1111/j.1600-0471.2007.00281.x. ↑ Boudot-Lamotte, A. 1972. "J. D. Latham et Lt. Cdr. W. F. PATERSON, Saracen Archery, An English version and exposition of a mameluke work on Archery (ca. A.D. 1368), with Introduction, Glossary, and Illustrations, London (The Holland Press) 1970, XL + 219 pp". Arabica. 19, no. 1: 98-99. ↑ Jallon, A.D. Kitab Fi Ma "Rifat "Ilm Ramy Al-Siham, a Treatise on Archery by Husayn B. "Abd Al-Rahman B. Muhammad B. Muhammad B. "Abdallah Al-Yunini AH 647 (?) - 724, AH 1249-50 (?) - 1324: A Critical Edition of the Arabic Text Together with a Study of the Work in English. University of Manchester, 1980. OCLC: 499854155. ↑ Faris, Nabih Amin, and Robert Potter Elmer. Arab archery. An Arabic manuscript of about A.D. 1500, "A book on the excellence of the bow & arrow" and the description thereof. Princeton, N.J.: Princeton University Press, 1945. Translation of "Kitāb fī bayān fadl al-qaws w-al-sahm wa-awsāfihima," no. 793 in Descriptive catalog of the Garrett collection of Arabic manuscripts in the Princeton university library. ↑ Jandora, John (2010). "Archers of Islam". The Medieval History Journal. 13 (1): 97–114. doi:10.1177/097194580901300104. ↑ Cambridge University Press (2000). Cambridge Ancient History pg 174. ↑ The Ashvayanas living on river Guraeus (modern river Panjkora), which are the Gauri of Mahabharata, were also known as Gorys or Guraios, modern Ghori or Gori, a wide spread tribe, branches of which are still to be found on the Panjkora and on both sides of the Kabul at the point of its confluence with Landai (See: History of Punjab, Vol I, 1997, p 227, Publication Bureau, Punjabi University, Patiala (Editors) Dr L. M. Joshi, Dr Fauja Singh). The clan name Gore or Gaure is also found among the modern Kamboj people of Punjab and it is stated that the Punjab Kamboj Gaure/Gore came from the Kunar valley to Punjab at some point in time in the past (Ref: These Kamboja People, 1979, 122; Kambojas Through the Ages, 2005, p 131, Kirpal Singh). ↑ gutenberg.org Caius Julius Caesar. Caesar's Commentaries. Translated by W. A. Macdevitt. ↑ The Bows of China. Stephen Selby. Journal of Chinese Martial Studies, Winter 2010 Issue 2. Three-In-One Press, 2010. ↑ Korea archery at anthromuseum.missouri.edu "During the Choson period (1392-1910), Korea adopted a military-service examination system from China that included a focus on archery skills and that contributed to the development of Korean archery as a practical martial art." ↑ Zimmer, Heinrich and Campbell, Joseph (1969). Philosophies of India pg 140. Princeton University Press. ↑ Gunn, Steven; Gromelski, Tomasz (2012). "For whom the bell tolls: accidental deaths in Tudor England". The Lancet. 380 (9849): 1222–1223. doi:10.1016/S0140-6736(12)61702-4. "The mean depth of arrow wounds, for example, was an inch and a half, that of gunshot wounds six inches, not counting balls that went right through the body or head"
↑ T.R. Fehrenbach. Comanches, the history of a people. Vintage Books. London, 2007. ISBN 978-0-09-952055-9. First published in the USA by Alfred Knopf, 1974. Page 125. ↑ T.R. Fehrenbach. Comanches, the history of a people. Vintage Books. London, 2007. ISBN 978-0-09-952055-9. First published in the USA by Alfred Knopf, 1974. Page 553. ↑ "Amazonian archers". BBC News. 2008-05-30. Retrieved 2010-01-05. 1 2 Johnes, Martin. "Archery—Romance-and-Elite-Culture-in-England-and-Wales—c-1780-1840 Martin Johnes. Archery, Romance and Elite Culture in England and Wales, c. 1780–1840". Swansea.academia.edu. Retrieved 2013-03-26. ↑ "The Royal Company of Archers". Retrieved 2012-12-17. ↑ Bertalan, Dan. Traditional Bowyers Encyclopedia: The Bowhunting and Bowmaking World of the Nation's Top Crafters of Longbows and Recurves, 2007. p. 73. ↑ Crombie, Laura (2016). Archery and Crossbow Guilds in Medieval Flanders. Woodbridge: Boydell and Brewer.